Hugh Latimer (1470- 16 October 1554). Hugh Latimer is regarded by many as one of the most zealous reformers in England, having begun his ecclesiastical career as a priest and a fierce defender of the Church of Rome . Not only zealous , he was an impressive orator with great sincerity who pressed his teachings into the conscience of the listener. His style was very much pitched at the common man, with both simple and familiar expressions , and a droll humour that made his discourses interesting and suited the need of the time. His father was a farmer at Thurcaston, near Sorrel in Leicestershire. A tenant farmer he employed six men and ran stock of about a hundred sheep and thirty cows. Hugh was the only son, and had six sisters. From this modest background, Hugh was educated at the local school and then sent to Leicester with a view to joining the church. He went to Cambridge in 1484 where he took his degree and became a priest. Such was his zeal and dedication that he was appointed cross bearer for the University, a post he held for seven years. In his time at Cambridge Latimer gave an oration against the protestant reformers and severely criticised Philip Melanchthon for introducing innovations. Among his associates at Cambridge was Thomas Bilney who played a major role in converting Latimer to the reformers` cause. This he did by dropping criticisms and comments on corruptions etc of the Catholic church into discussions. Eventually Bilney asked Latimer to cast aside any pre conceived prejudices and to examine and compare the two doctrines with a clear mind. convinced that his discourse about Melanchthon had worked such an effect. his father through the workings of Jesus Christ. papist at this time), especially for stating that the locking up of the Scriptures from the people was a flagrant abuse of power. In a short time Latimer, Bilney and other reformers were summoned before the clerical court. the church and getting out amongst the congregation. The purpose of rewarding Latimer was essentially a routine matter, as the real intention of it was to gain his assistance to make the kings supremacy acceptable to the people, moreover, in London, not in the wilds of Wiltshire. Latimer, however, had had enough of the vanity and vices of the Court, and stayed in Wiltshire preferring to reclaim wandering sinners. However, his idyll did not last long as by duplicity and numerous slanders he came under attack by the ministers of Bristol. They were mainly country ministers but included a few who drew up (as was often the manner) quotes from his sermons that could be twisted against him. such as `speaking lightly of the worship of saints` and that there was `no material fire in hell`. These utterly petty complaints were made to the Bishop of London who summoned him to appear before him. bishopric. it was alleged comments about this legislation that were next used to obtain his imprisonment. It came about following a fall, when Latimer went to London for treatment. His whereabouts came to the attention of the papists and Gardiner, who had him imprisoned in the Tower for the next six years along with his friend the bishop of Chichester. The accession of Edward VI saw a general amnesty and he was released from his prison. Lord Chancellor and immediately cited him before the Council. Perhaps it was intended to frighten a dangerous adversary out of the kingdom, but Latimer was not afraid to face his critics and promptly went to London. 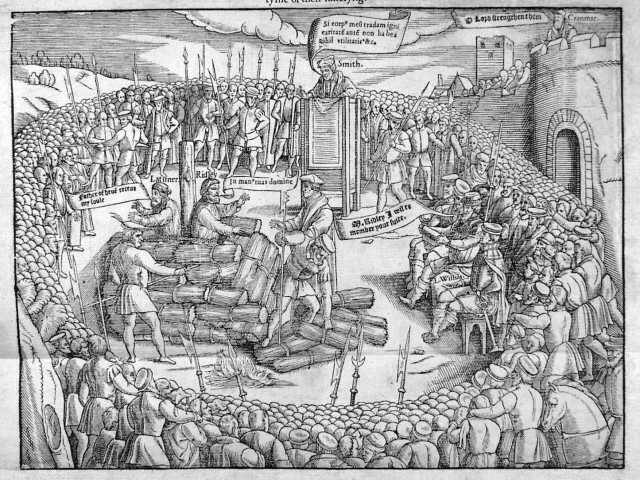 The Council were aggressive and critical and, along with Cranmer and Ridley, he was again confined in the Tower. In the spring of 1554 the three were sent to Oxford under close confinement, with the intention that they publicly debate their views with representatives from the Church of Rome. This was in itself a great sham as they were denied even pen and paper to make notes, and access to books and Scriptures. The inevitable charges arose , including the old favourite transubstantiation, and equally inevitable was the finding of guilty of heresy. On the 16th October Latimer and Ridley were burnt at the stake on ground on the north side of Balliol college. 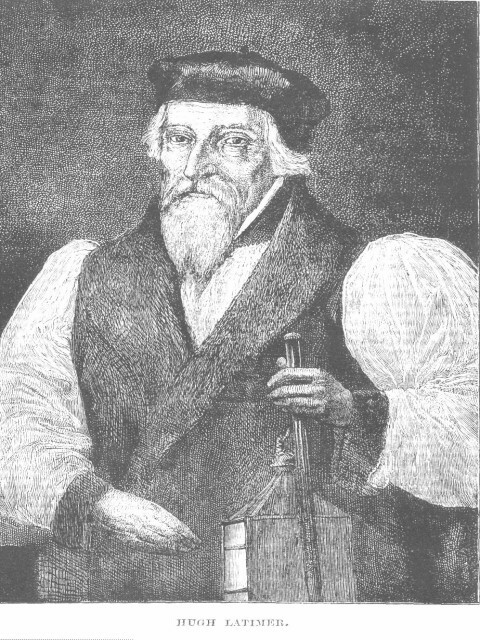 Cranmer lived a while longer before being burnt on 21 March 1556.